Contributed by: Rakhamon (morfeus2@hotmail.com). 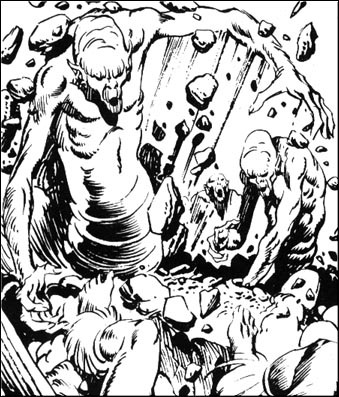 The Mound-dwellers are from Marvel's classic Bêlit saga. They appeared in CtB issue 59. "'Man, are you mad?' she asked, 'that in your madness you come seeking that from which strong men fled screaming in old times?'" - Robert E. Howard: "Worms of the Earth"
Speed: 30 ft., burrow 20 ft.
Face/Reach: 5 ft. by 10 ft./10 ft. Appearance: Mound-dwellers are monstrous crosses between humans and worms that lurk in dark underground caverns for fear of the sun. The upper body of a mound-dweller is that of a lanky humanoid with pitted, wrinkled skin and a sunken face. Their lower halves resemble enormous earthworms. Their skin is a pale bluish-gray hue and moist to the touch. A typical mound-dweller is about 6 ft. (180 cm) high when erect and about 10 ft. (3 m) long. Mound-dwellers do not speak or make any sort of sound, even when in battle. Combat: Mound-dwellers prefer to fight from ambush, suddenly emerging from beneath the ground to attack their targets. When enraged, mound-dwellers fight with their powerful fists and use their constriction to deal with any powerful foe (such as a mage or powerful warrior) as quickly as possible. If battle is going against them, they attempt to flee by burrowing into the ground. If they have been offended (if for example someone has stolen one of their relics) they will doubtlessly return and will doggedly pursue their enemy. Improved Grab (Ex): To use this ability, a mound-dweller must hit with one of its slam attacks. If it gets a hold, it can constrict. Constrict (Ex): A mound-dweller deals 2d4+4 damage with a successful grapple check against Large or smaller creatures. Blindsight (Ex): Mound-dwellers perceive their environment using other senses than sight. Invisbility and darkness does not effect them, though they must still make a successful Spot check to notice a creature standing still or moving slowly and carefully. This ability is effective up to 60 ft.
Light Sensitivity (Ex): Mound-dwellers are very sensitive to strong light (such as bright sunlight) and will not willingly expose themselves to it. When in strong light they will take 1 hp damage each turn (since their skin dries out) and receive a -1 penalty on all rolls until they leave the light. Tremorsense (Ex): Mound-dwellers can automatically sense the location of anything within 60 feet that is in contact with the ground. Skills: When burrowing under the ground, mound-dwellers receive a +10 circumstance bonus on hide checks. Habitat/Society: Mound-dwellers are intelligent and social and normally dwell in small communities within larger cave systems. The only population known lives in tropical climes (near the Black Coast) but others may exist under other lands. They have no speech but communicate amongst themselves using some unknown form of non-verbal language (though they are not telepathic). Mound-dwellers usually live in harmony with other races and creatures unless they are attacked. They venerate silver above all else and will go to great lengths to acquire objects made from the precious metal. Thieves that steal silver objects from the mound-dwellers are relentlessly pursued. A few silver objects are the only material possessions a tribe of mound-dwellers will have.